MacGregor launches a new training centre in its Aberdeen office in the UK to deliver specialists skills and competencies to its engineers and customers. Aberdeen office is the leading launch and recovery service provider within MacGregor's Global Lifecycle Support Division. Central to the training centre has been the creation of a bespoke, real-time davit training rig, which replicates the operation of onboard work boat and lifeboat launch and recovery davit systems including towing boom operation. By having the training centre, MacGregor will be able to offer highly-skilled personnel and world class service to its customers in the offshore industry with the focus on professional planned maintenance. This also supports the ongoing development and expansion of MacGregor's planned maintenance programmes and provides an addition to the service portfolio. The Aberdeen branch has accumulated a wealth of knowledge and experience training engineers, up to inspector level, and conducts more than 300 maintenance and inspection jobs on its own and third party davits in the North Sea every year. 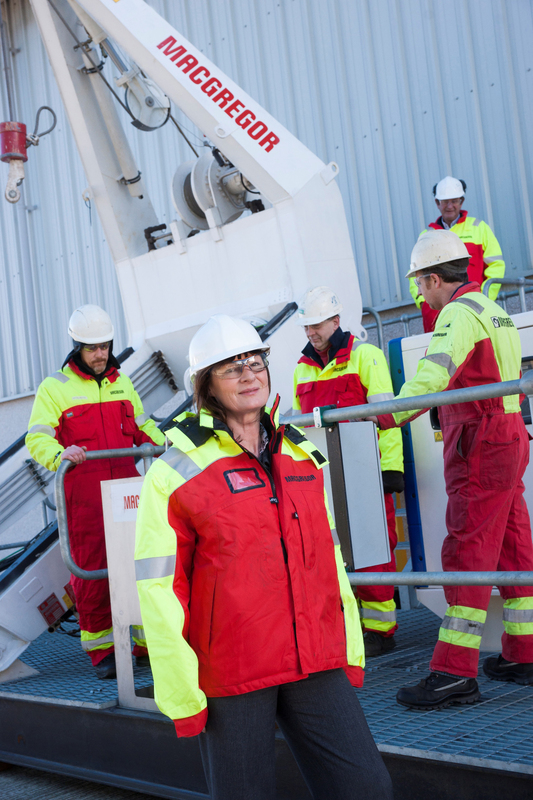 Lloyds Approved to LR IRZ17 for servicing and testing of lifeboats/launching appliances and on-load release gear, the Aberdeen operation supports MacGregor's Original Equipment Manufacturer (OEM) Unit in Kristiansand. Also LRQA ISO9001-ISO4001 and LR URZ17 accredited for survey, servicing and testing of lifting appliances, MacGregor delivers a bespoke 24/7, full-maintenance agreement, which operates seamlessly with its customers through an integrated management system that provides predictive maintenance as well as continuous fleet uptime benefits. The delivery of crew training is becoming an integral part of the company's service portfolio and the creation of an in-house specialist centre will ensure consistent competency standards across the industry. The company delivers its crew training sessions from its operation in Peterseat Drive, Altens through a blend of technical theory and practical training. Certification is awarded once attendees pass a competency test and the training programmes are designed to be offered to groups of up to five crew members at a time. MacGregor engineers will attend the centre from across the world to undertake the in-depth training and development programme, which is supported through the creation of a new building competence centre at the company's manufacturing plant in Norway. The high level of service training required to be a world-class specialist is key to the programme foundation, which can take three years to complete to ensure engineering meet the high level of standards expected. Practical elements of the training will be undertaken by two of the industry's most experienced engineers. Technical Davit Engineering and Inspector Training will be led by HSEQ Coordinator Kim Morgan. Kim joined MacGregor in 2014 with more than 24 years' experience in the oil & gas industry rising from Electrical Engineer to Project Management. Practical Hydraulics Training will be delivered using the new training rig by Davie Johnson who has more than 20 years' deck machinery industry experience and is very highly-regarded by North Sea vessel professionals including Superintendents and Captains. Fault finding training will also be provided to help crew members rectify minor problems that may arise while at sea. As a result, the Aberdeen centre has also been recognised within the MacGregor Group's European network as a specialist service & training provider for launch and recovery systems. Christopher Byles, UK Branch Financial Controller for MacGregor (GBR) Ltd, says: "The launch of the training centre supports the drive towards continuous skills and competency development within the offshore industry. It also perfectly complements our davit manufacturing and servicing unit enabling MacGregor to provide a comprehensive offering to customers operating in the energy and merchant shipping sectors. "Aberdeen will become synonymous with davit training within the MacGregor Group and the wider offshore industry and this centre will, for the first time, deliver standardised training that will arm crews with the specific knowledge they need davits in a safe and controlled manner. "We have built substantial knowledge and experience, which will aim to not only pass onto our service agreement customers and those operating our equipment offshore, but also into MacGregor's global network to ensure the Group has fully-trained and competent engineers on every continent to support its global client base for davit inspection and maintenance." MacGregor offers world leading engineering solutions and services for handling marine cargoes and offshore loads. The scope of our integrated packages is growing and now also includes Hatlapa, Porsgrunn, Pusnes and Triplex products.